● ONE COLLECTION, ENDLESS POSSIBILITIES: The carefully selected oils in our Essential 8 Collection have been chosen for their individual characteristics and benefits as well as their ability to seamlessly blend together for your unique aromatic preference and therapeutic needs. From the respiratory benefits of Eucalyptus and Peppermint Oils, to the soothing and stress reducing properties of Lavender and Tea Tree, each oil can be combined with one another to form endless combinations of fragrance and function. The wide range of aromas offered in this collection creates the perfect environment for any occasion, from seasonal favorites such as Frankincense, to everyday classics like Sweet Orange. 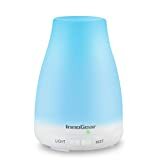 When used in diffusers, essential oils offer an allergen free alternative to heavily perfumed candles and chemically rich air fresheners. In addition essential oils have proven to be an all natural deterrent for insects and mosquitoes. Endless combinations await as you craft your own distinct creations all while finding which oils serve you and your family's needs and preferences best. DIRECTIONS: Many customers have questions about how to use essential oils. Each of our essential oils are safe and easy to use regardless of your preferred method. As a general rule, for topical use essential oils should be diluted in a carrier oil like coconut or almond oil in a 3­5% solution. On a practical level this is 3­5 drops of essential oils per teaspoon of carrier oil (less if using on a baby or child). Once you have mixed your oil into the prefered carrier simply massage into affected areas of the skin and enjoy the therapeutic benefits. 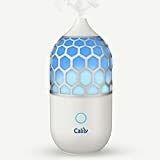 When using oils in a humidifier or diffuser simply add 3 to 5 drops to the water reservoir prior to use and instantly enjoy the calming and aromatic effects. 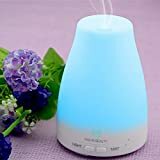 Recipes for essential oils are easy to access with tips and tricks being circulated all over social media, organic medicine and healthy living websites, as well as print media and television. Endless possibilities await with Art Naturals Essential 8 Collection. Order today risk free and find out which method is best for you! JUST A SAMPLE OF OUR HUGE LINE OF ESSENTIAL OIL PRODUCTS: Our Essential 8 collection is just a small sample of the ArtNaturals Essential Oils Collection which includes: Sandalwood Coriander Lilac Basil Myrtle Geranium Grapefruit Dill Weed Jasmine Neroli Lemon Cinnamon Juniper Frankincense Lemongrass Thieves Fennel Rosemary. Eucalyptus Cinnamon Vanilla Lavender Tangerine Spearmint Cilantro. 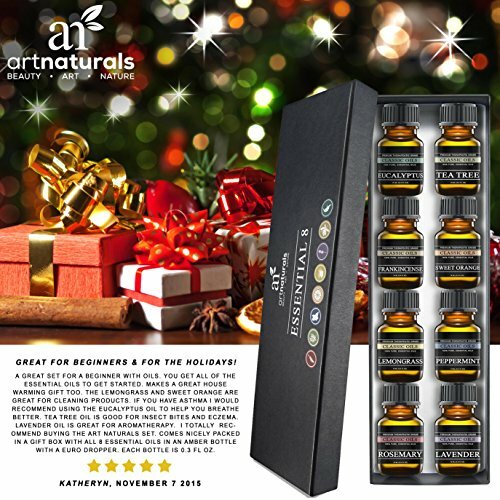 ArtNaturals also has Massage Essential Oils Essential oils for weight loss Diffusers for essential oils Essential oils cases Essential oil guides Essential oils for allergies Essential oils for joint pains Organic essential oils Pure essential oils. Our essential oils are of the quality of such brands as: Young Living Myrrh Aura Cacia Doterra Wyndmere Sunbreeze Healing Solutions Angelica Eden's Garden Plant Now Foods Therapy & Guru. A Perfect aid in the relief of Bee Stings, Eczema, Nausea, Nosebleeds, Dandruff, stress relief, joint pain anxiety, nasal and chest congestion. The Essential 8 includes 8 of the top 10 essential oils.